The Flying Stars, G. K. Chesterton - Oh, I actually quite liked this. Christmas Party, Rex Stout - Really good except for the unfortunate racism. The Raffles Relics, E. W. Hornung - Unlike others starring a ‘classic character’, it makes me want to read more about the character. The Price of Light, Ellis Peters - Definitely a favorite in this book. Classic Cadfael: just lovely and sweet and Christmassy. A Present for Santa Sahib, H.R.F. Keating - Odd. I guess it could be charming in some lights. Not sure about the dialect.. The Christmas Train, Will Scott - A charming crook fools the police. Not amazing but decent. Markheim, Robert Louis Stevenson - Huh. takes a while to get going and the language is thick, but actually its pretty good. A Chaparral Christmas Gift, O. Henry - Eh. A bit tortured in plot despite decent style. The Chopham Affair, Edgar Wallace - Shrug. I’m not sure what all the business is about.. possibly a reference I'm not getting. 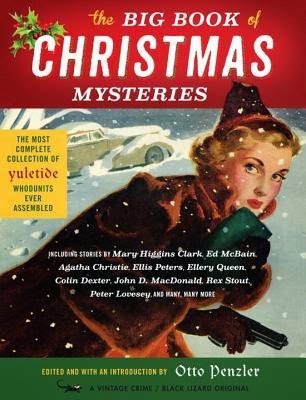 A Christmas Tragedy, Agatha Christie - Not bad. Not terribly gripping but the plot is fine. The editor saved a lot of their big guns for this last section. Most of them feature the author’s popular recurring character. I’ll run through them from least to most enjoyable. “The Chopham Affair” is a bit odd. It is framed as a story of an unsolved case, but that frame story seems to have little to nothing to do with the actual story - about a blackmailer laid low by the husband of one of his victims. I presume that one or more of the characters was previously established and knowing more about them would make it make sense. “The Christmas Train” and “A Christmas Tragedy” are both decent, serviceable stories, but not really anything special. I really want to like Miss Marple, but I haven’t read anything that’s sold me on her yet. “A Chaparral Christmas Gift” gets points for style (set in the Old West) but not for plot, which is sort of clumsy and dull. “A Present for Santa Sahib” is in one sense a cute story about a detective who clears a small-time con man who’s been falsely accused of pickpocketing, as a bit of Christmas goodwill. On the other hand, eesh have I had enough of British writers’ impressions of Indian accents. “Markheim” takes a while to get going, but then it’s really good, right up until the obvious twist. It’s about a thief turned murderer tortured by his conscience, (and/or possibly the devil). “Christmas Party” is a Nero Wolfe story, and “The Raffles Relics” is about the thief AJ Raffles. Both of these stories make me interested to read more about the characters. The Nero Wolfe story’s only flaw is a bit of recurring dated language and attitude toward an “oriental” girl. The Raffles story takes place late in that character’s life, and I found it a fun teaser for the world. “The Flying Stars” features a crime-solving priest (not the only one, as I’ll get to in a minute) who helps discover a thief at a local party posing as a member of the family. It also features amateur dramatics. “The Price of Light” is definitely in the running for my favorite story in this whole dang book. I’m not surprised - it is a Cadfael story, and I love Cadfael. If you’re unfamiliar, Cadfael is a medieval monk who solves crimes and grows herbs (and has a slightly dodgy past as a soldier). If you have a chance to watch the television adaption starring Derek Jacobi, take it! This story follows the donation of a set of silver candlesticks to the abbey on Christmas, and their subsequent disappearance. There are several motives possible just from the people who arrived in the train of the minor lord who donated the things. Cadfael solves the case, of course, but in his own inimitable and unfailingly kind way. Overall, despite quite a few duds, I’d recommend this book to anyone looking for a bit of murder and mayhem to brighten up the holiday.